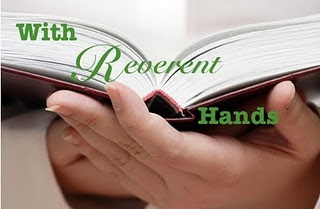 If you would like to participate in the With Reverent Hands series of guest posts on this blog, please contact me and I'll send you the template! This week's guest post is by one of my favorite bloggers! Strangely, I only learned her real name when she emailed me her submission. Zee writes at the fabulous Notes from the North, reviewing books in a cold climate for the betterment of us all. She is a huge fan of Anne Shirley. I also really like how she will review non-English books on her blog. I always wish more international, dual language bloggers would do this because it gives me a sense of more of the cultural nuances present in different areas. Also, it makes me more likely to seek out translated books. So I'm sure you can see why I am into the Zee, and I hope you check her out! I'm going to guess in 2002 or 2003. I was in college and I am resonably certain it wasn't during my first year. I found it browsing the book shelves of one of my favourite bookstores, Waterstones on Princes Street in Edinburgh (West End), it is signed by the author and I thought it was cool, plus the book sounded funny. Okay this is easier. I love it because it makes me laugh. It makes me laugh out loud sitting on the train. It made me laugh when I was a college student without much experience with children and now that I have more experience with children it makes me laugh even more. This book, although there are sad moments, NEVER fails to cheer me up. Never! Gilmore Girls (the early seasons). It is the same rather dry wit. Really, if you like anything that is witty and that makes you laugh out loud. This is a hard question. It is chick lit but I don't want anyone to be but off by that label. Because it is so incredibly funny, and poignant and ultimately pretty true. It will probably appeal the most to those who have experience with children in general and mothers in particular. That said, I'm not a mum and I love it! Charlie and his classmates have just returned from a swimming trip. We parents split up into our usual groupings, identifiable by different parenting techniques. The Come Here Wayne or I'll Hit You division win hands down at getting their children into the car quickly. The Hello Darling Was Swimming Lovely I've Got Something Interesting to Tell You in the Car approach works fairly well, combined with determined eye contact and firm holding of hands, and Kate, Sally and I are off, madly inventing interesting things to talk about. But the dithering approach of Stop That George mixed with attempts to chat to other parents means that a fair number of people are in for a long night. I enjoyed the format of the review. Ladies you did a nice job. It is always fun to see what kind of books other bloggers love. Oh, yes, this does sound very funny, and being a mom, I am sure that this is a book I would love. Thanks so much, Zee, for sharing this one with us. I have never heard of this book before, but now I am wanting to go out and grab a copy. I particularly liked the quotes you provided. They were hilarious! This sounds like a delightful book! I agree, Zibilee, the quotes you provided are wonderful. They did their job, as now I really want to read this! Thanks for the recommendation. This sounds like a really fun book. I'm definitely going to be checking this one out. Haha, I love that you distinguish "Gilmore Girls (the early seasons)." Season 1—AMAZING. Then to me it just went progressively downhill. It's the same reason I always indicate "Friends (the early seasons)" when talking about favorite TV shows. Great post. I will keep this book in mind, as I am interested in it. Thanks for highlighting it!